Hawaii locals love their canned meats! Besides Spam, corned beef is another favorite food. Whenever we get together with fellow “expatriates” for a Hawaii homestyle get-together on the mainland, our friends Patrick and Phyllis S. often cook corned beef hash patties because they are a popular pupu. They are so ono (delicious) that they are eaten quickly. 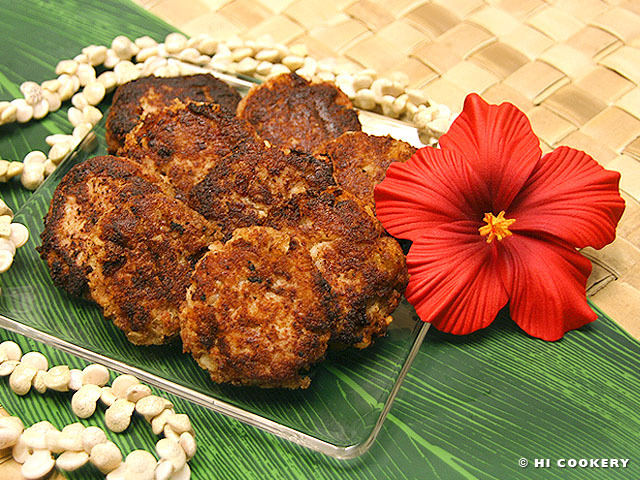 Add some aloha to an appetizer tray and cook corned beef hash patties on National Corned Beef Hash Day! 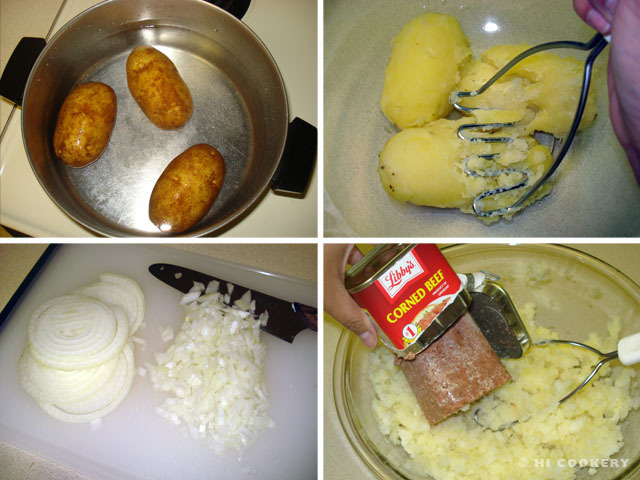 Boil the potatoes in salted water until a fork easily goes into the middle of the potatoes. Peel the potatoes then coarsely mash them. Dice the onions. 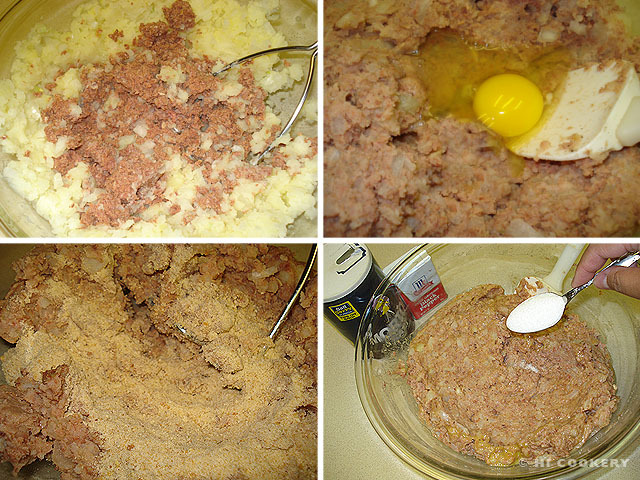 Crumble the corned beef. Add these to the mashed potatoes. Beat in the egg. Mix in the bread crumbs a little at a time (if mixture is too wet). Season with salt, pepper and sugar. Refrigerate the soft mixture for 2-3 hours to firm up. Shape mixture into 2-inch round patties. Refrigerate for at least another 30 minutes. Heat a little oil in a skillet. Place a few patties (do not overcrowd) and fry over medium high heat until the bottom is browned and crisp. 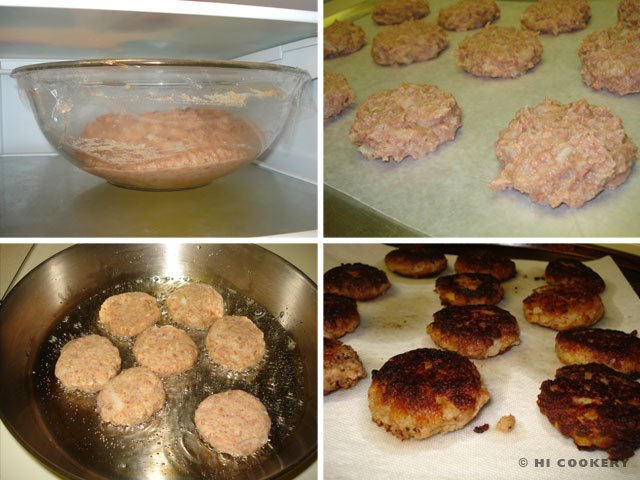 Carefully flip the patties over and continue frying. Drain on paper towels. Serve hot. Place thawed hash browns or grated potatoes in a large mixing bowl. 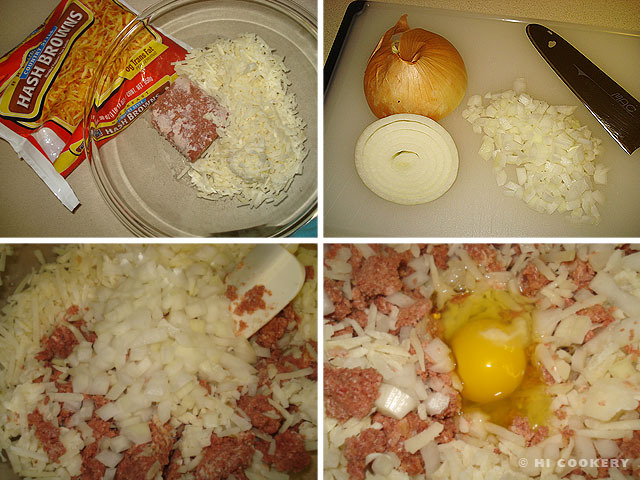 Add the chopped onions and corned beef. Mix well. Stir in the egg and combine well. Roll into a small ball then flatten into 2-inch round patties. Refrigerate for at least an hour to set. Coat in panko. Fry like above. Drain on paper towels. Serve hot. Patience is a virtue with this recipe. 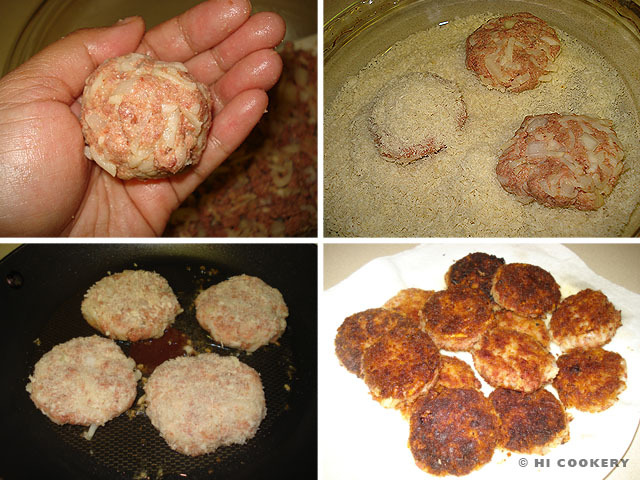 Make sure the corned beef hash patties are firm in the refrigerator before frying or they will fall apart. Brown them on one side completely before turning over and cooking the other side. We have another Hawaiian hash recipe for an island-style saute. Cook canned corned beef with tomatoes and onions following the directions on a prevous post. I was just thinking about how my mom made corned beef hash patties. Then I saw the recipe posted. You’re so welcome, Keoni! This is one of Islander’s favorites so our local “ex-pat” friends, Pat and Phyllis S., who gave us this recipe, make this whenever we get to visit them. I just made these! It’s so cold out and saw that I had a couple of cans of hash, but wanted to have something different than how we usually eat it and I saw this recipe! They are perfect! Thank you for posting! Mahalo! Glad you like these corned beef hash patties. Sending some aloha and warmth your way!